Chocolate Molds come in all types and are really easy to make. They are great for treats and favors. 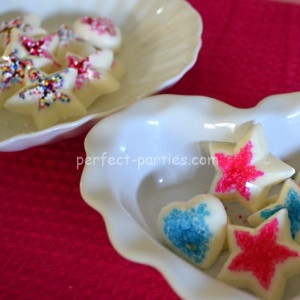 Use sprinkles to match your party theme. 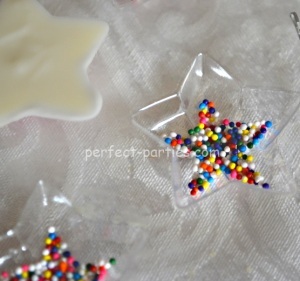 We found the crystals and the little rounds sprinkles worked the best. There are all a rainbow of colors you can select from making it easy to match your party colors. While chocolate is melting pour sprinkles into mold. Fill generously. Gently spoon some chocolate into each cavity. Tap side of mold gently to even out. Fill your spoon with just enough chocolate to fill. It's easier to add more than to scrape excess with a butter knife. However if you do have excess, when you pop out the chocolate you can gently break it off with your fingers to make the shape stand out more. We found our molds at Michael's craft stores. We get several of the same pattern because they are great for craft projects too. We also tried the larger sprinkles but they didn't stand out as much. For some reason they got "lost" in the chocolate. 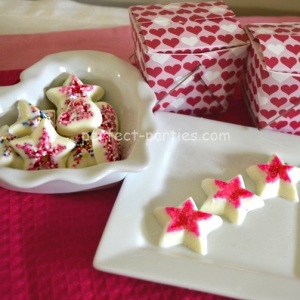 White chocolate is definitely going to show your sprinkles more.